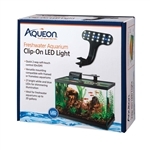 The Aqueon Freshwater Aquarium Clip-On LED Light is a convenient and affordable option to add LED lighting to any aquarium. This elegant, super thin Clip-On LED light hovers over the aquarium, providing optimal lighting for a bright thriving freshwater fish-only tank environment. Quick 3-way soft-touch control. Easily mounts on framed or frameless aquariums using versatile mounting screw. Ideal for freshwater fish-only aquariums up to 20 gallons. Peak PAR=27. Avg PAR=15. Peak LUX=2060. Avg LUX=1225. The average output is at 12" from the center of the light in a 16" X 16" area.